Whoot hoot, a third post this week. 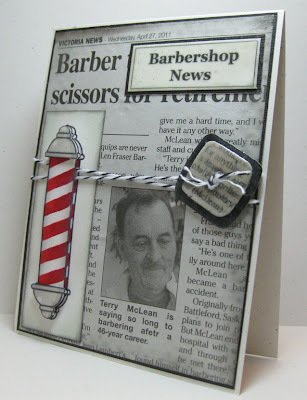 This card was a little hairy to make, heheh never mind me, it is some random barber humor that is just plain silly. A barber at the local shop where my husband and son get their hair done is retiring after something like 46 years (wow). So in honour of this amazing achievement my husband asked for a card.. of course. It took forever to make but was well worth it. I figured that the local paper should have a article on the retirement, how lucky am I that it was published earlier this week. So yes, the so called designer paper, is the actual newspaper article (spelling error and all). I printed off a random barber pole clip art three times to make it dimensional and popped it up with foam tape. I used Microsoft word for the sentiments. 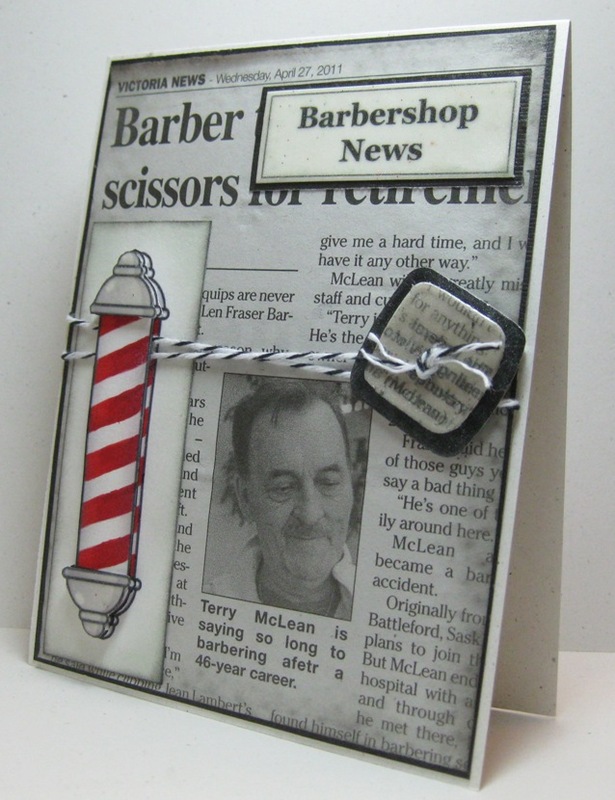 The whole Barbershop News cut out is embossed with clear embossing powder, as is the bottom and top of the barber pole and buttons. The buttons are a Sizzlits die cuts. I did a lot of ink edging in grey and black then I finished with twine. I also printed off and cut out a comb and scissors for the inside, then embossed those as well to make them glossy. All in all it turned out great. Supplies: Natural white and black cardstock, Designer Paper-Newspaper, Microsoft word, random clip art, twine, clear embossing powder, Sizzlets die cuts. It is that time of the year where eager young minds are about to be let loose in the world. I am still trying to wrap head around that fact that one of those young minds is one of my best friends sons and only a year older then mine. Making this card was a little bit of a reminder that this time next year it will be my very own eager young mind counting down the days till high school grad. 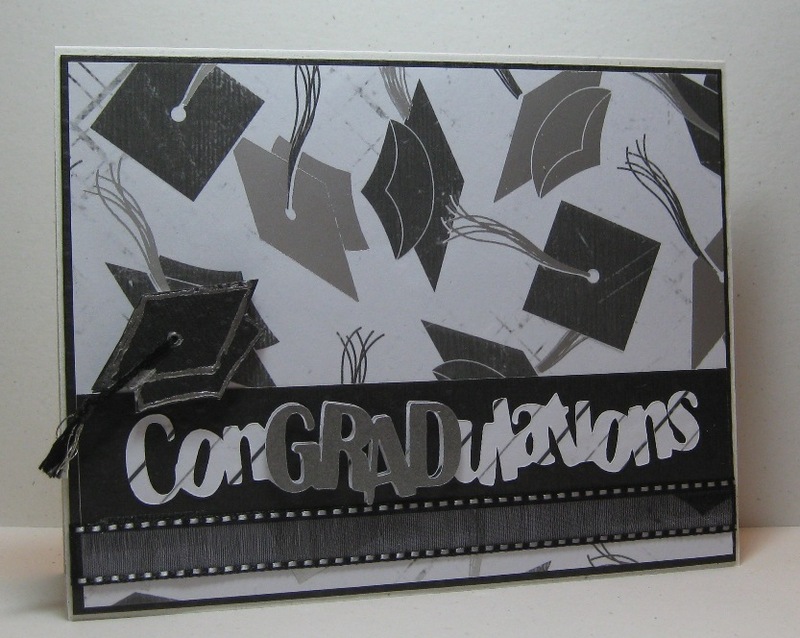 I love this double-sided Designer Paper from TPC Studio, the silver and black academic hats were perfect for this card. It took me forever to create the tassel that I crafted from embroidery thread but it turned out great. I used my Cricut and Sure Cuts a Lot software for cutting out the Congradulations, I am still trying to get the hang of sizing but it worked out well. 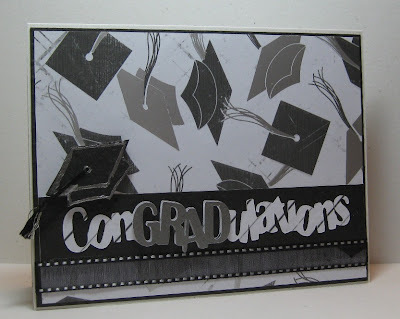 I embossed 2 academic hats in silver on black cardstock then cut them out and used foam tape to create an embellishment. Happy Easter Monday :) Did everyone have a great weekend? I know I did, although I did not get another blog post in I did get some crafting time and lots of relaxation. I was not sure if there was going to be a Mojo Monday today, but I'm am pleasantly surprised. I already have a Mother’s Day card ready but I not really happy with it, so that is what I focused on today. I love the sketch today. 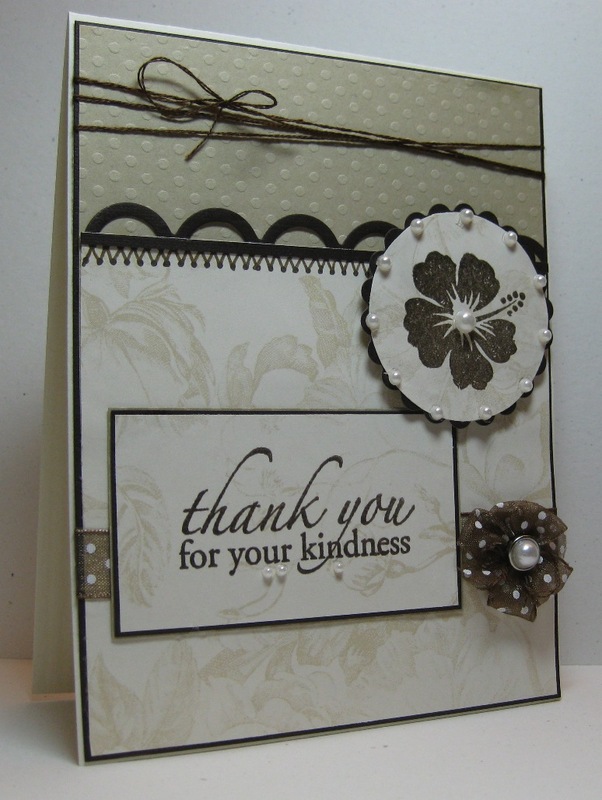 Supplies: Cream and brown cardstock, Designer Paper-Memory Box, Inkadinkado-Flower, Spellbinders-Lacey Circle, EK Success edger punch, Prima Flowers, KaiserCraft-Pearls, American Craft Ribbon, Liquid Glass embossing powder. Times Flies, even when it is not all fun. I am looking forward to this up and coming long weekend for so many reasons, but I do plan to hide away in my craft room at some point for a little one on one time with my neglected craft supplies. This is my only card for this past week and I have not even been able to share the love on any of the blogs I follow, including family. I hate that. OK ok enough complaining. I am glad that the gals at Mojo Monday give us a week to get it all together :). I have this huge stash of G-Studio stamps, you know the ones, the $1.50 ones from Michaels. I always seem to buy them but then tuck them away. My new goal is to pull them out and ink them up, there really are some nice ones that I have hoarded. 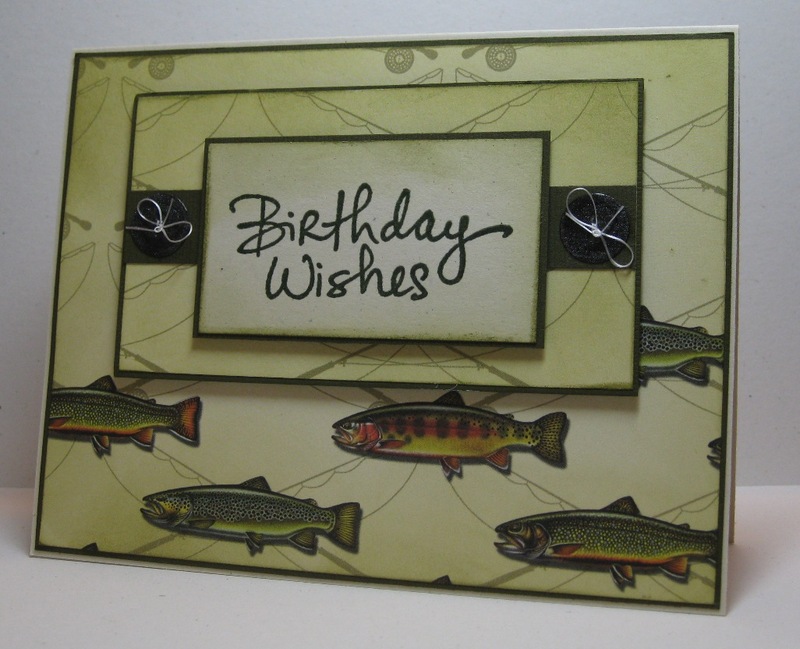 An example you ask, why I used a cute little Happy Birthday for this very card. I stamped it with VersaFine-Imperial Purple then embossed it with Liquid Glass embossing powder. 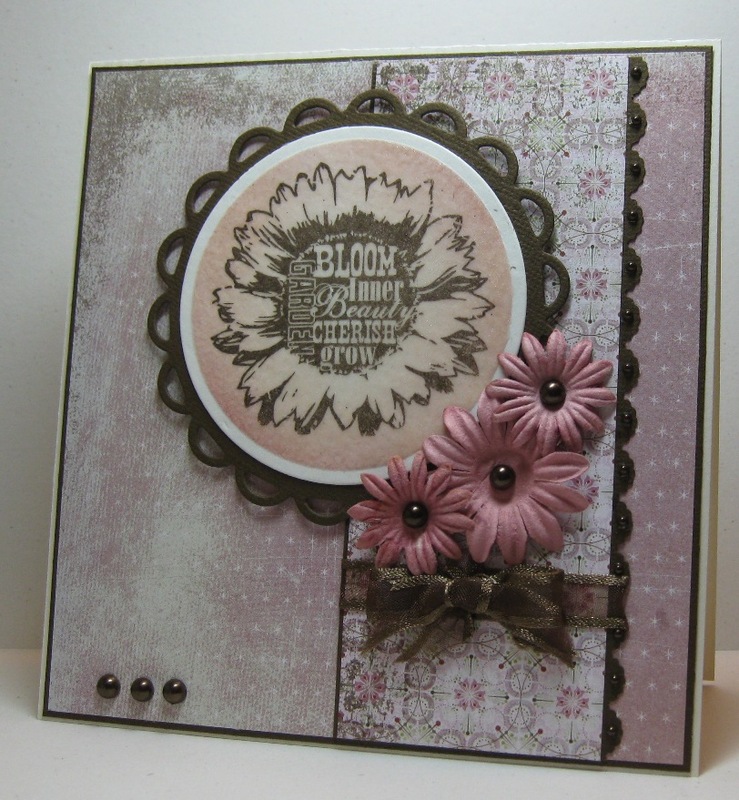 I love the sketch this week, I found it easy to work with and I am rather happy with the card I was able to produce. My mother-in-law has a Birthday coming up and I think this worked out nicely for her. ﻿I used my stash of Memory Box designer papers, then added a nice shade of purple cardstock as the background and I embossed it with a Cuttlebug embossing folder, then matched that throughout the card with a Stampabilites- Faded Text Background stamped in Versacolor-Heliotrope. I used my Mini Bowdabra to create a lovely bow with a rich purple Celebrate- it ribbon and I finished with Kaisercraft gems. 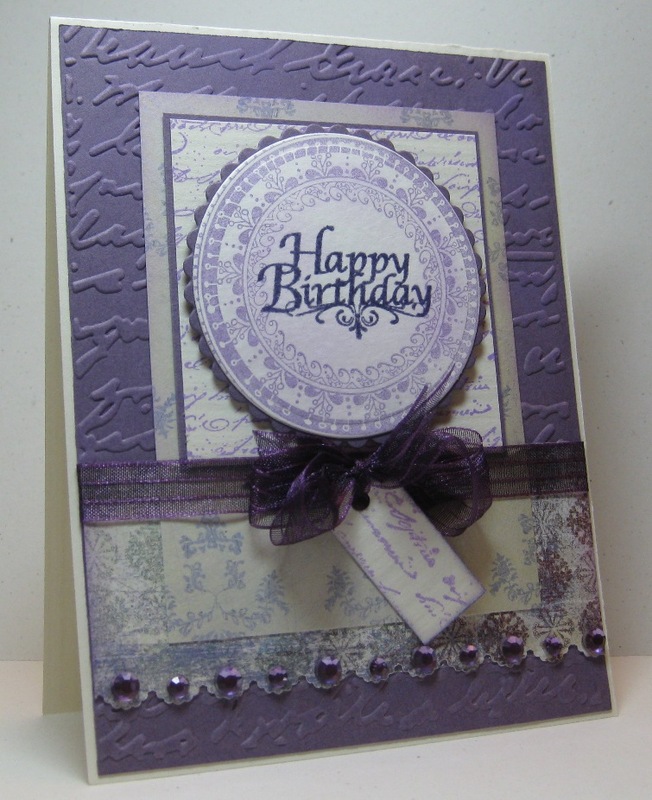 Supplies: Cream and Purple cardstock, Designer Paper-Memory Box, Spellbinders & Cuttlebug die cuts and embossing folders, Stampabilities-Faded Text Background, G-Studio- Happy Birthday, Inkadinkado-Round Frames, Kaisercraft- Gems, EKSuccess-Edge Punch, Celebrate It -Ribbon. I will be back later this week... for sure. I did this card is pieces then hoped that I could tie it all in. I started with the base layer and worked my way up. Once I had the second and third layer pieced together I added the ribbon. The little ribbon flower was made with my mini Bowdabra. I was going for a multi-looped bow but once I had cut and shaped it I thought it resembled a small flower more, so I added the little pearl brad to complete it. I stamped the sentiment and flower with Versacolor-Pinecone then embossed them with Liquid Glass embossing powder. 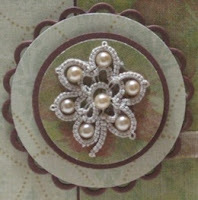 I used embroidery floss in place of twine then added lots of pearls to finish. 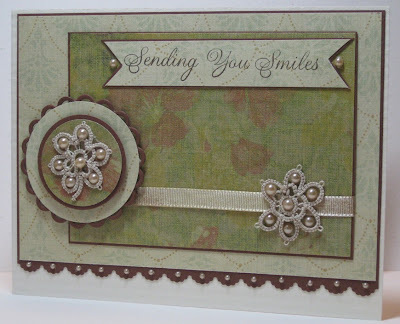 Supplies: Cream, brown and textured tan cardstock, Designer Paper- Anna Griffin, Close to my Heart-Thank you, TPC Studio-Spring Break, misc ribbon, Recollections pearls, Making Memories pearl Brad, Spellbinders. Happy Monday... again. I think the only thing I like about Mondays is the chance to do Mojo Monday. Today though I think the effort I put into this card was way way more then it needed to be. I have glue stuck to everything, itty bitty pearls were flying and bit and pieces cover just about every surface :). My sister made me these beautiful tatted flowers, I think they fit this card beautifully. I added a pearl in each of the petals to add a little bling, I even managed something close to a macro shot. I know I missed parts of the sketch but well..... Any hoo, the double sided designer paper is very pretty, and there are very nice red flowers in it that really don't show up well in this picture. 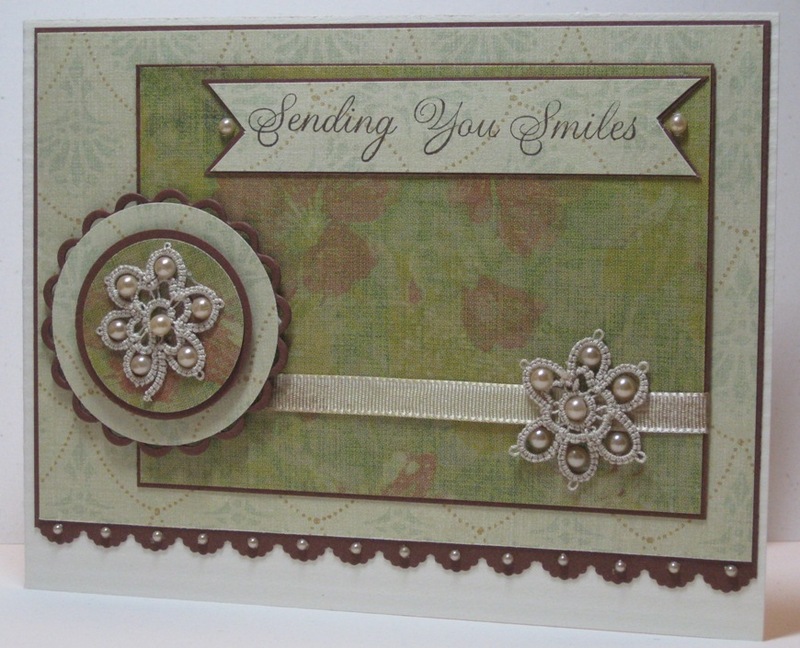 Supplies: Cream and rust/brown cardstock, Designer Paper-K&Company, Tatted Flowers-Barbara Derksen, Amuse-Pearls, Impression Obsession- Sending you Smiles, Spellbinders-Lacey Circle, Stampin’ Up!-misc circle punches, misc ribbon. Happy Birthday to my big Brother. Have a fabulous day Dave, I know your lovely wife will spoil you. My brother loves fishing, so I do try to make cards inspired by that. 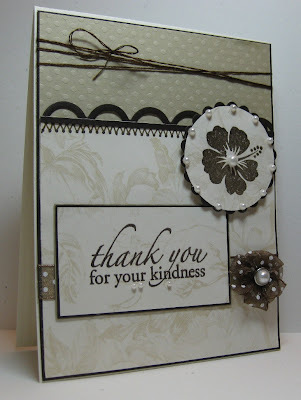 This is a simple card, multi layers making use of the designer paper theme. I embossed Sizzlet buttons with clear embossing powder then laced them with thin floss-like twine to make it look like fishing line. The Birthday Wishes is embossed with a hunter green embossing powder. Supplies: Cream and green cardstock, Designer Paper-Sugar Tree, Stamp-it Birthday Wishes, Sizzlits-buttons, misc floss, clear embossing powder. On another note, Thank you to Sarah Forhan, my Mojo card from this week has been posted to the Bowdabra Facebook page due to my cute little bow. I am feeling pretty happy about that. Check out the Bowdabra blog for some great ideas. Thank you very much to Debbie - http://debbiesdashofthisandthat.blogspot.com/2011/03/new-blogger-award.html for the blog award. This award is going to take me a little work so I will try to Post about that this weekend. I am happy it is Friday, have a fabuous weekend. If you visit, please leave a comment, they make me smile.